In 2014, advancement of new gTLD program floods out over 1,300 new gTLDs, including over 70 new Chinese gTLDs. Shortly, these new domains will be open to the public for registration. Chances to register domain names under new gTLDs are huge, meaning great possibilities on Cybersquatting and abuse of the domain names on trademarks; therefore, with more and more enterprise business showing online, corresponding trademarks on the Internet will encounter a big challenge. CNNIC, a registration management and root server operating agency for Chinese top-level domains, is capable to provide various packages of comprehensive domain name services and online trademark protection solutions. Trademark Clearinghouse is a trademark protection mechanism developed by ICANN in coordination with its newly launched new gTLD program. It seeks to provide reliable information for trademark rights holders and prevent the likelihood of trademark rights violations. When preparing for its new gTLD program, ICANN has established Right Protection (RPM) in response to the concerns and grievances from the trademark protection industry. The establishment of TMCH also serves to coordinate RPM. As ICANN stipulated, all the new gTLDs must set up a Sunrise Period before being publically available. During the Sunrise Period, only trademark holders registered at TMCH can apply. ●Before a new gTLD becomes available to the public, he or she can enjoy priority registration of domain names matching the corresponding trademark records in TMCH at least 30 days earlier. ●Within 90 days into the Sunrise Period, he or she will be notified if a third party registers a new gTLD domain name that matches the protected trademark records. ●In case of domain name disputes, his or her TMCH records will be a powerful evidence that significantly increases the chance of winning the lawsuit. ● Any other marks that constitute Intellectual Property (IP) rights in accordance with the registry's policies and that meet the eligibility requirements of the Trademark Clearinghouse. Within 90 days after the end of the sunrise period (Trademark Claims Period), when trademarks domain names are registered, enterprises can receive notifications and get timely reports on trademark domain name registrations. Before each top-level domain registration opens to the public, for at least 30 days priority registration period (sunrise period), trademark holder in TMCH have rights to register domain names corresponding to the trademarks to avoid trademark domain names cybersquatting. 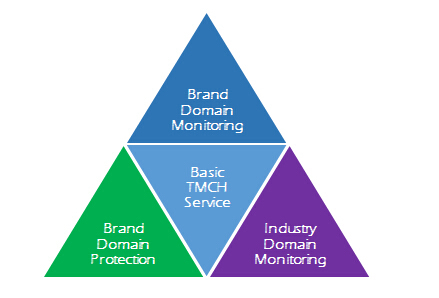 Basic TMCH services can only protect the domain names that are perfectly match with the enterprise brand.To further expand monitoring scope and time, CNNIC provides additional domain names monitoring services. Enterprises can set the keywords identical or similar to their own trademarks to monitor domain name registration and application on the Internet. A cost efficient way to get proposal report on thousands of TLD registration and leverage protection effect. Domain has become an essential and fundamental resource to develop new business; enterprises can explore the products and services or brand development strategies of the industry from domain perspective. CNNIC can monitor the new registrations and the changes based on client’s needs, and provide insights on the development trends of the industry in the first time.